Marvel Studios and their associates has a great reputation of making fun action orientated superhero movies. Ant-Man, their newest movie, is another classic blockbuster from Marvel but…it is very different from the rest of the films. Ant-Man is a character driven heist movie. It also completes Marvel’s phase 2. Ant-Man stars Paul Rudd, Michael Douglas, Corey Stroll, Evangeline Lilly, and Peyton Reed directing it. 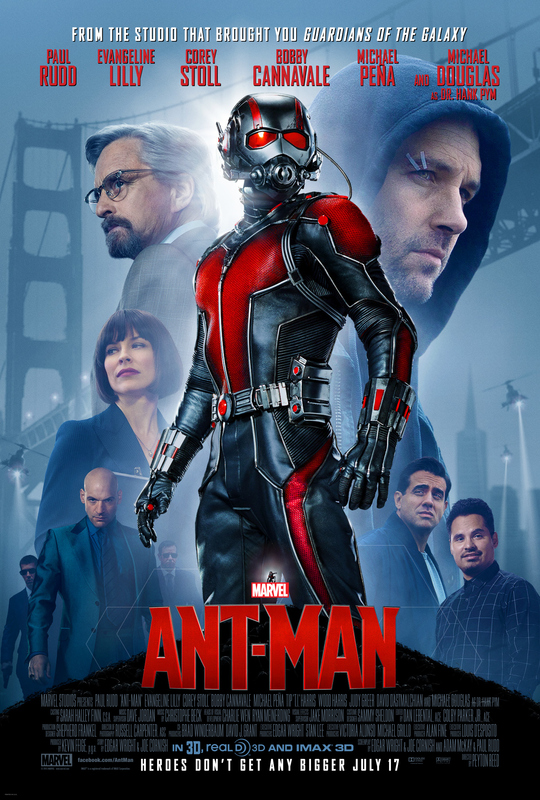 Scott Lang, Paul Rudd, is an ex thief struggling with the life on the outside. He is unable to find or hold a job because of his previous criminal record, although the public seems to admire him for his criminal actions. He is unable to see his daughter, Cassie. Scott, his best friend, Luis (Michael Pena), and Luis’s gang of thieves (T.I. & David Dastmalchian) break into a house to steal the contents of a vault hidden in a basement. Scott finds the Ant-Man suit. Hank Pym (Michael Douglas), the creator of the Pym Particle that allows the suit’s wearer to shrink in size, asks Scott for his help. Hank and his daughter, Hope (Evangeline Lilly), want to break into Pym technologies to steal a technology that is deadly enough to change modern warfare. Pym’s protégé, Darren Cross (Corey Stroll) has created a suit called the Yellow Jacket that could devastate the world. Scott, Hank, Hope, and Scott’s crew must succeed with the heist or the world will be in peril from organization known as Hydra. Ant-Man is unlike any other movie. The first Iron Man can be compared to Ant-Man. Ant-Man is Scott Lang’s redemption story. That’s one of the negatives of the film. Not the redemption story itself because the story is great. The first twenty minutes are slow burn and it takes a while for the heist storyline to get rolling. It’s a minor complaint so don’t expect straight fun and action in the first act of the movie. The other problem with Ant-Man is the generic villain that Marvel Studios has constantly have had in their movies. Corey Stroll played Darren Cross, and he was amazing. Cross is one dimensional character. Stroll does a good job of making the audience see the villain’s motivations but never felt like he was threat. However, Ant-Man is loaded with positives. Ant-Man’s biggest positive is it’s not a failure. The movie could have completely bombed after the whole Edgar Wright’s departure. Wright was originally going to direct the movie but Kevin Feige, the head producer at Marvel Studios, decided Ant-Man could be a catalyst for phase 3 by introducing key concepts that will be used in future Marvel Studios movies. He hired the right director, Peyton Reed, and the perfect actor as Paul Rudd to play Scott Lang. Reed and Rudd rewrote Wright’s and Joe Cornish’s script by adding references to future heroes and of course adding a lot comedic dialogue. For example, Hydra was mentioned in my synopsis. Hydra shows up in the third act wanting to buy the Yellow Jacket technology to destroy the Avengers and of course rule the world. Hank Pym, himself, has distaste for the Avengers and especially Tony Stark. Scott Lang fights an Avenger in a hilarious scene. Avenger tells the person in the intercom, “please don’t tell Cap about this.” Paul Rudd, Kevin Feige, and Peyton Reed deserve a lot of credit in rewriting the story and made the movie feel like Ant-Man does take place in the Marvel Cinematic Universe. Peyton Reed deserves a lot of praise for his direction of the film. Peyton Reed, his visual effects team, and editors deserve a lot of praise. Reed and his visual effects team used a filming technique called Macrophotography. The cinematographer, Russell Carpenter, and his team would take a picture an object for example, Thomas the Tank Engine. The picture would blow up the size of Thomas to make him look a giant in the photograph. The visual effects team then would insert the photograph into the film and the visual effects team would us motion caption actions of Paul Rudd or Corey Stroll to complete the scene. Personally, the visual effects team for Ant-Man should be nominated for a few Academy Awards. Ant-Man made the audience feel like they were a little person with the sounds and visuals on screen. My fellow audience members walked out of the theater eager to see more Ant-Man scenes in Marvel Movies. The actors deserve a lot of praise for making the movie funny and enjoyable. Paul Rudd was the star of Ant-Man and Scott Lang. He knocks the role of Scott Lang out of the ballpark. Michael Douglas is literally fantastic as Hank Pym. The two actors nail the mentor/student relationship between Lang and Pym. Evangeline Lilly had great chemistry with Douglas. She plays the jealous daughter who doesn’t believe that her father is proud of her. Douglas and Lilly nail that relationship. Scott Lang’s crew which includes Michael Pena, T.I., and David Dastmalchian add a lot of humor to the movie. T.I. steals a cop car for example, and Pena plays an important role in the movie dealing the Avengers. Ant-Man is very well acted which helped make the movie hilarious. Ant-Man is an important Marvel movie. It really sets up the Marvel Cinematic Universe to come and helps the worldwide audience believe that comedian Paul Rudd can play a hero. The studio has good ideals for a sequel; however, to get the Ant-Man sequel that the world deserve is…people need to go see this movie while it’s in theaters. Ant-Man is very suitable for the families because kids will love the action scenes and adults will get the subtle humor. Ant-Man gets a 4 out 5 from me.